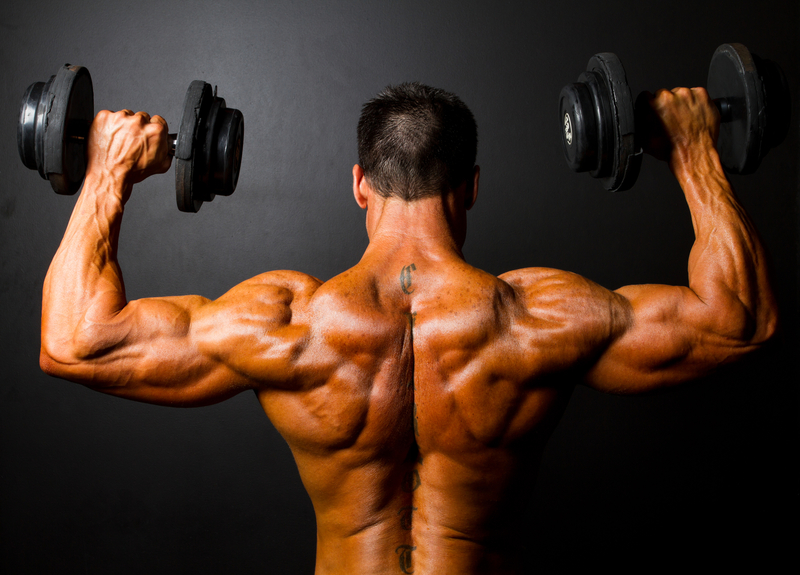 From an aesthetics viewpoint the most important muscles to develop are the deltoids. They give the shoulders width, especially development of the medial head. Coupled with a lean mid section, big shoulders give the much sought after “V” shape. If you are lucky to be blessed with long clavicles, in conjunction with a narrow hip structure, you can build big shoulders and a tremendous “V” shape. This was the hallmark of a number of early bodybuilders, the most famous being Steve Reeves who allegedly possessed a delt to delt width of 24 inches. Even bodybuilders who possessed naturally narrow shoulders were able, by developing their medial deltoids, to create the illusion of wide shoulders. The first Mr Olympia Larry Scott is a prime example of a bodybuilder who was able to build big shoulders, despite having a narrow structure. With regard to upper body strength, the ultimate test before the popularity of the bench press was the standing press, the chief developer of the deltoids. 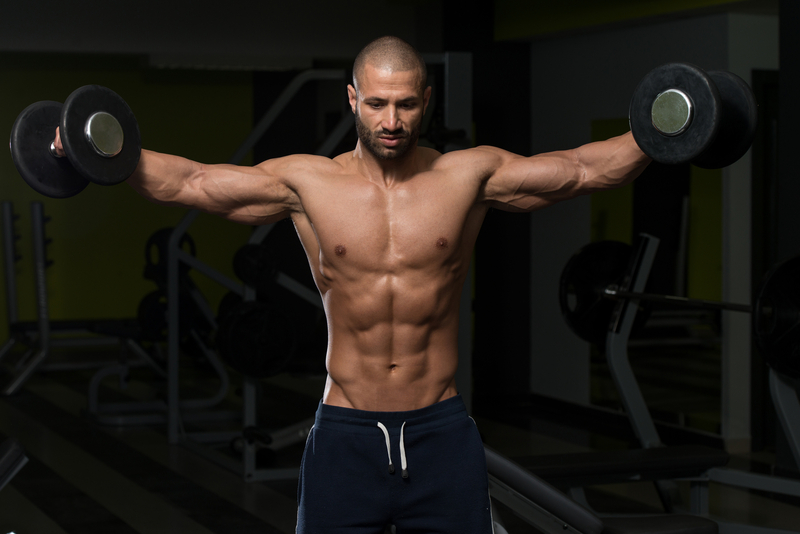 It remains the most effective means of building the front deltoids. However in their attempt to build big shoulders, what many trainees appear to overlook, is that the deltoid muscle consists of three heads. Each muscle head needs to be developed in order to give that complete look. Most trainees attempting to build big shoulders treat the deltoid as a single muscle, like for example the chest. This neglects the fact that it’s musculature has more diverse functions, which should be reflected in its training and development. It is of no use relying purely on pressing alone to optimise deltoid development. In order to build big shoulders you need to develop all three heads. The shoulder joint itself is the most flexible in the human body, which allows a diverse range of movement. Unfortunately as result it has to give up some of its structural stability. As a consequence the shoulder region is more susceptible to injury than most of the rest of the body. Weight training injuries to the shoulders are accordingly more common than elsewhere. Care may need to be utilised with regard to exercise selection and loading. There are a number of exercises that although effective for increases in strength and hypertrophy compromise the joint. They are probably not worth the risk of inclusion in your program. One of these exercises is the behind neck press, another is the narrow grip upright row. Before I get flamed, yes I am aware of individuals who’s training routine was heavily based around these two exercises. There are many great bodybuilders going back to before the golden era, who advocated the behind neck press. A number of them were immensely strong and could use in excess of 300 lbs as a training weight. There are admitedly individuals who’s shoulders appear to be flexible enough to incorporate the behind neck press without incurring any problems. Some shoulders can handle the exercise, others cannot. If you are one of the latter, you need to stop doing it. You are not going to be able to effectively work shoulders not amenable to this exercise. From a strictly anatomical point of view it is an unnatural position, and in order do it you must maximally externally rotate the shoulders. This places them in a very vulnerable position, and puts excessive strain on the rotator cuff muscles. The majority of people do not have the necessary shoulder flexibility to effectively perform the movement. Additionally, they must tilt their head forward to get the bar behind it, increasing potential injury. Ideally replace this move with the conventional press in front of head or alternatively with dumbbell presses. 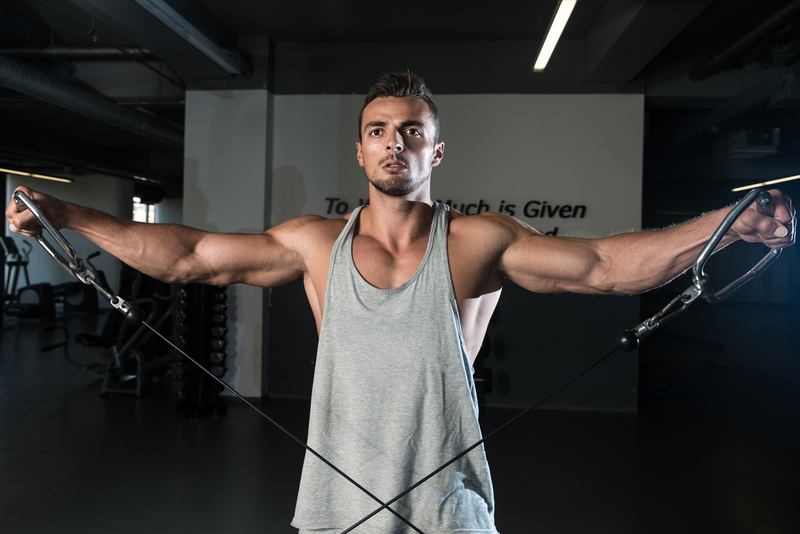 The Upright Row also puts strain on the shoulder, by loading them whilst they are internally rotated. It is notorious for causing impingement injuries. However when employed with a wider grip it is less likely to cause injury. It can usually be performed safely and effectively after this adjustment has been made, however the shoulders are still internally rotated under load so I still would not recommend it. Exercise: Bent Over Dumbbell Rear Delt Raises With Head On Bench/bent over seated rear delt raises. Exercise selection should reflect the function of the specific head of the deltoid. The above named movements if performed optimally are effective for complete deltoid development, and will build big shoulders. This hits the anterior and medial head of the delts and should be the cornerstone of your workout. Whilst pressing moves are unsurpassed at adding meat to your anterior delts I was only able to get that capped rounded look to my shoulders when I started to train lateral raises. These are extremely effective at putting width on your shoulders by building the medial deltoids. These can also be performed using cables. The posterior head receives little if any benefit from pressing. The bent over lateral raises can be performed standing, or seated at the end of a bench. Additionally performed face down on an incline bench they are also effective. Too many trainees rely purely on pressing to build big shoulders. Pressing alone for the deltoids develops the anterior head, but does not recruit the medial, or the posterior head to any great degree. This can potentially create muscular imbalances. This is especially evident in trainees who bench press heavily, in addition to pressing. Muscular imbalances also lead to injury. Additionally the shoulders appear narrow from the front and the side when they lack medial and posterior development. Compound moves in general are more effective than isolation work for building size and strength. Utilise as heavy a load as possible on the presses, whilst maintaining good exercise form, for moderate reps in the 6 to 8 range. Isolation work I believe is more effectively performed in the 8 to 12 rep range. The deltoid rear head gets little, if any stimulation from pressing work. I have never been a great fan of isolation exercises or machine training, however the deltoid medial and rear heads require this. The almost 360 degree flexibility of the shoulder girdle enables extensive use of different angles. Cables especially can be utilised effectively over a large range of movement. Build big shoulders by giving the following workout a run for a few months. If you are going as heavy as you can on the compound moves (as you should be), whilst maintaining good exercise form, you will need to utilise a little more rest between sets than with the isolation work. Do not sacrifice form for increased weight however.